It’s summertime, so I’m looking for a bunch of fun books to read. I just ordered two books by John Scalzi (Fuzzy Nation and The God Engines), two books by Dean Karnazes because I’m training to run a marathon (Run! : 26.2 Stories of Blisters and Bliss and Ultramarathon Man: Confessions of an All-Night Runner), plus Zero Day: A Novel by Mark Russinovich. I’ll let you know how they turn out. Steven Levy just wrote a new book about Google called In the Plex: How Google Thinks, Works, and Shapes Our Lives. It succeeds the most on the “how Google thinks” part–if you want to understand how Google thinks, get an overview of Google, or understand its impact on the world, this is the book for you. I think anyone interested in Google would enjoy this book. People who don’t know much about Google will get a good overview. People who are really interested in Google or the search industry will get a better understanding of how Google thinks. And even if you’re an expert, you’ll probably learn a few new tidbits. For example, Levy reveals the identity of GoogleGuy, the Google representative who answered questions from webmasters as early as 2001. You’ll also hear about inside-Google allusions like Audrey Fino or Emerald Sea. Given that Levy isn’t a computer scientist or a Googler, I wasn’t sure how deftly he would internalize or explain how Google looks at the world, but for the most part he nails it. The book, like many accounts of Google, emphasizes the company’s focus on making decisions based on data and logic. At some points I felt that Levy pushed this point too hard. On the other hand, I recently had a conversation with a Google colleague about Lady Gaga, and the word “scalability” cropped up a lot more than you would expect for a conversation about a pop star. 🙂 I don’t think Google is full of purely left-brained eggheads, but I’m willing to concede that compared to the average population, we probably skew further in that direction than most places. Reading the book, I realized how much you could write about the different facets of Google. Even in 400+ pages, some topics get short shrift; it felt like Levy covered Google News in a single, condensed paragraph. But Levy gives complete and clear explanations for the parts of Google that receive his focus. Here’s a simple litmus test: if you’ve read more than 2-3 of my blog posts in the past or follow me on Twitter, you’ll probably enjoy reading In The Plex. – Lulu will take PDF files for a book. Blogbooker.com will try to create a PDF from a blog. Unfortunately, my blog made BlogBooker choke (I have 991 posts from my blog) — even when I excluded comments. – Blurb.com will try to create a book from a blog, but it only supports blogs hosted on WordPress.com, not other WordPress blogs. That will help some people who want to print their blog into a book, but not everyone. – I had the best luck with FastPencil. In order to reduce the size of your exported blog, you’ll first want to go to your comments section, click on the “spam” link and clear out any spam comments by selecting all the spam comments and clicking “Empty Spam”. Then you can export your WordPress blog (from the Dashboard, click Tools, then Export) as an XML file that you can download to your computer. From there, FastPencil lets you upload the .xml file and then select which blog posts to include in the book. You can also filter by time, which I had to do. Even my blog posts (no comments) from the last year and a half still made a 350+ page book, and FastPencil choked on turning my entire blog into a book. I recently got to read Freedom, the new book by Daniel Suarez, and can highly recommend it. If you haven’t read Suarez’s earlier book Daemon then you should read that Daemon first. If you have read it, Suarez picks up where the first book ended. Daemon and Freedom are set in a future tantalizingly close to the present. In Daemon, a software tycoon and game designer named Matthew Sobol is dying. Sobol writes a program called the Daemon that scans news sites on the web for stories about his death. When the Daemon detects (via the web) that Sobol has died, it springs into action. A wider audience can enjoy Daemon, but computer science and techie folks will especially enjoy how plausible some of the ideas are. For example, the Daemon initially stays below the radar of the government by recruiting from within a massively multiplayer online role-playing game (MMORPG), which skews toward a younger demographic and not older FBI agents. As someone who has seen weird, emergent behavior like this, I can understand why a bunch of people on the web enjoyed Daemon. Freedom continues the world of the Daemon, but now we learn that the Daemon might not be all bad; it might just be ruthless in changing the world. Freedom pushes the concepts of Daemon even further: members of the guerrilla resistance fight against copyrighted DNA and for sustainable next-generation energy. They also share a private augmented reality. The new members of the “darknet” also share an interesting reputation system that’s a bit of a cross between Whuffie and PageRank. You can enjoy Freedom for the action (there’s plenty of that, especially later in the book), but the “idea density” of Freedom will leave you thinking afterwards. Recommended, especially if you like Daemon or other books like The Truth Machine or The Unincorporated Man. Update: See the bottom of this post for newer information. That’s right — not a single magazine or newpaper showed up. Instead, eight different times I was told that an “overwhelming response” meant that title wasn’t available. So where do things stand now? Well, in the 4-10 weeks that I had to wait for the subscriptions to start, those 15,000 frequent flier miles expired. 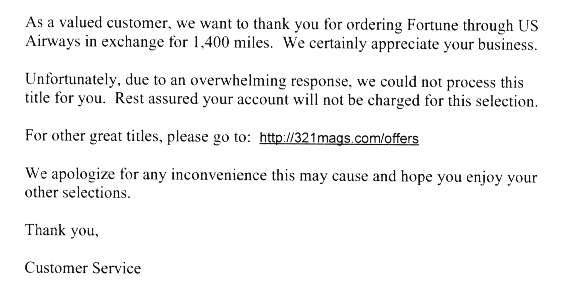 I can’t try to subscribe to any other magazines or even donate the miles to charity at this point. You know what, U.S. Airways? Just keep the miles. 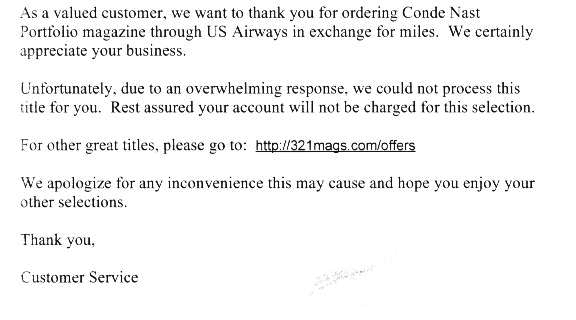 Or better yet, if anyone from the U.S. Airways Dividend Miles program sees this post and wants to do something nice, please donate those miles to charity. Update: Some new developments have happened since I wrote this blog post. 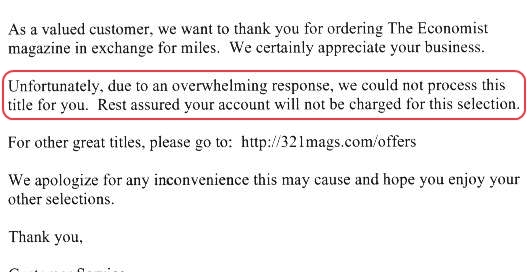 US Airways wrote the day after I blogged to apologize for a bad experience, said that they’d investigate what happened, and then they reinstated the miles. That’s about as much as I could ask for, and I appreciate their response. I donated the miles to charity. 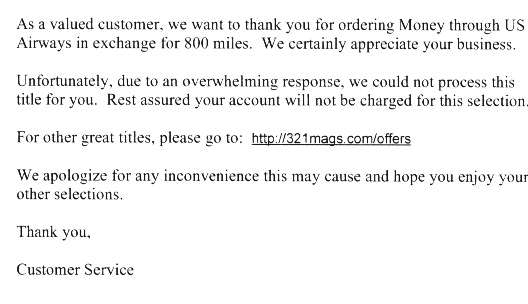 A couple days later, the vendor for the “Magazines for Miles” program contacted me. 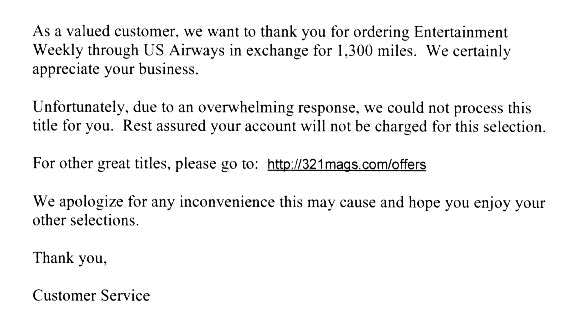 They said that when they verified the zip code for the magazines with the zip code on file with the airline, it didn’t match, so the order was sent to the airline for verification. 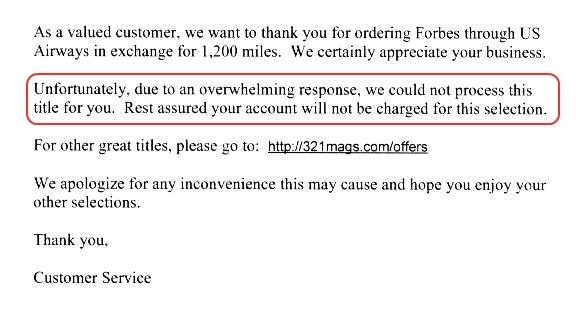 When US Airways confirmed my address, the vendor re-processed the order. 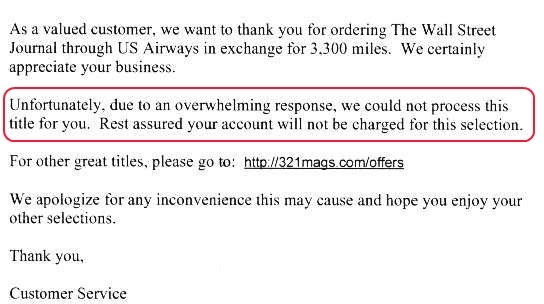 But then by the time the order reached US Airways for decrementing, the miles had already expired, so the order was cancelled. 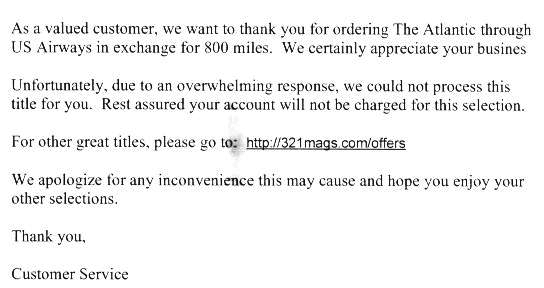 Due to a different glitch, the cancellation notice implied that the magazine inventory wasn’t available. The magazine vendor offered to send the magazines now, but I declined. I’d already donated the miles to charity and that’s enough to resolve the situation in my mind. As a software engineer, I can easily imagine this happening. 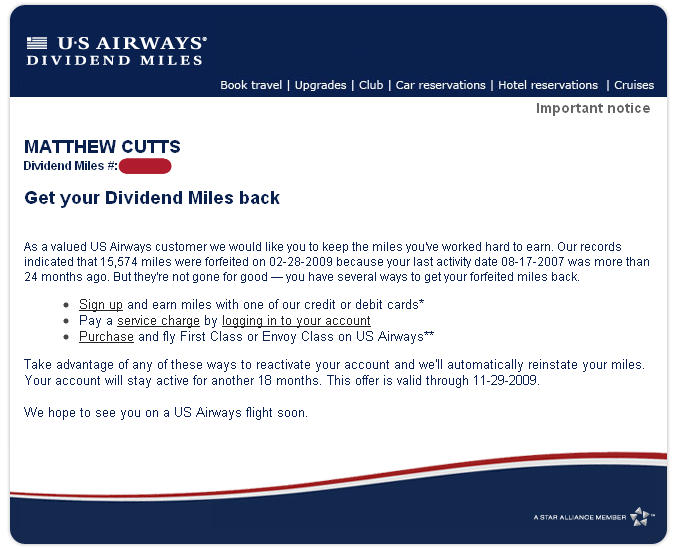 I guess the takeaway as a flier would be to use your miles before they get too close to expiring.